This article is about the sticky, explosive item. For other bomb-related articles, see Bomb. Gooey Bomb artwork from Brawl. The Gooey Bomb (チューインボム, Chewy Bomb) is an item in Super Smash Bros. Brawl, Super Smash Bros. 4, and Super Smash Bros. Ultimate. The Gooey Bomb attached to Wii Fit Trainer in Super Smash Bros. for Wii U. 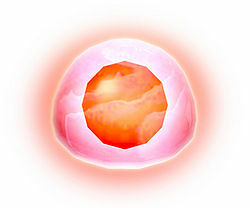 The Gooey Bomb is a glowing orange ball encased in a blob of goo. When thrown it can stick to anything, including characters. Eventually it starts flashing, then after six seconds it explodes, damaging anyone who gets hit with 22%. Gooey Bombs are extremely powerful, KO'ing most characters around 50%. However, if it sticks to a character, they can pass it to others by running past them, making it sort of like a hot potato game. The blast can still be avoided by dodging with good timing. Kirby, King Dedede and Wario can use their Inhale and Chomp moves to eat Gooey Bombs, but this will damage them. Kirby can also defend himself from a stuck Gooey Bomb by using the invincibility of his Stone move. It is possible to start a chain reaction of explosions when two or more Gooey Bombs are attached to one character. In Brawl, CPU fighters will often enter a random sequence of shielding and dodging if a Gooey Bomb has been attached to them, rather than attempting to move the bomb onto someone else. In SSB4, though, they will try and chase the nearest character. In Ultimate, characters appear to be shocked when it is about to explode while it is stuck to them. The Gooey Bomb trophy in Brawl. A bomb encased in a blob of goo. This material is highly adhesive, so you can throw it at and stick it to opponents. Once it's attached to someone, this nefarious device will explode after a set amount of time. Be wary, though--if you come into contact with the character carrying the bomb, it may stick to you. This truly is a high-risk item. This bomb will stick like glue to anything it lands on, moving or not, and then after a short while...BOOM! Don't worry if you get one stuck to you, though - just brush it off onto one of your opponents. Go on! Don't be shy! Just be sure to get out of the way quickly afterwards or you'll get caught up in the backlash! Mario throwing a Gooey Bomb at Wario. Bowser with two Gooey Bombs stuck to him. A Gooey Bomb, about to explode. Gooey Bomb's Page at Smash Bros. Dojo! This page was last edited on December 26, 2018, at 03:22.